Check out the archived videos and resources on this web site. MonarchLIVE explores monarch migration, biology, habitat needs, current research and citizen science. 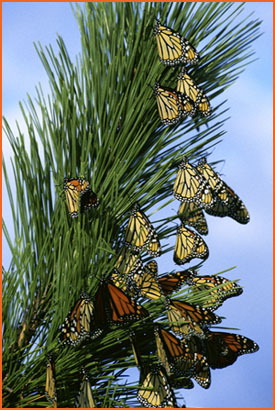 MonarchLIVE webcast and broadcast from the Monarch Butterfly Biosphere Reserve at Sierra Chincua, Mexico. This program was the first-ever live broadcast and webcast from these remote mountains where the monarch butterfly overwinters. The 60-minute program was hosted by Paulo Quadri with the National Commission of Natural Protected Areas in Mexico (http://www.conanp.gob.mx/). The program featured biologist Felipe Martínez, also with CONANP, and Dr. Isabel Ramirez with the National University of Mexico discussing: Monarch Butterfly Biosphere Reserve; rules for visiting the sanctuaries; history of finding the overwintering sites; migration biology; overwintering biology; oyamel forest; estimate of the overwintering population; predators and problems of surviving the winter; migration cycle; conservation and sustainability; and tourism, the local economy, and ejido system of land management. MonarchLIVE webcast and broadcast from Alternare, a community organization that promotes conservation and sustainable livelihoods for small farmers living in the Monarch Butterfly Biosphere Reserve. For more information about Alternare, go to http://www.alternare.org/. Alternare welcomes visitors, so if you visit the Monarch Butterfly Biosphere Reserve near Angangueo be sure to stop in. The 60-minute program was hosted by Rossana Landa with the Fund for the Conservation of Nature based in Mexico City. She was joined by Guadalupe (Lupita) del Rio, co-founder of Alternare. The program explains the concept of sustainability, ejido system of land management in Mexico, and some of the activities promoted by Alternare including: growing food organically; creating biofertilizer; conserving soil and water; making adobe bricks for houses and outbuildings; and training local small farmers. "Little Spaces; Big Results" was webcast from Eden Place Nature Center, a garden oasis in the middle of Chicago. Learn how small garden plots can have big results for butterflies and people. “Building the Population” was webcast from Battle Creek Elementary School in St. Paul Minnesota. Learn about monarch migration, summer behavior, monarch population growth, citizen roles in monitoring the population, and threats to monarchs. Monarchs depend on healthy habitats in three countries, and Canada provides a welcome summer home to thousands of butterflies.